When you go online and look at other people’s beautiful penmanship, it’s hard not to compare it to your own. Beautiful writing is wonderful to behold, but it often has the unfortunate effect of making you feel self-conscious about your handwriting. I know that pain, my friends. I have always lamented that my handwriting didn’t look like some ancient script from a parchment scroll. While I might never have that kind of cursive capability, I have been able to amp up my penmanship in this last year with a few key techniques. I want to share these techniques with you so you can improve your handwriting like a champ! You ready? Let’s go! Buying a wonderful, smooth pen has been a huge boon in my penmanship skills. Yeah, you can pick up any old 10 cent pen that you accidentally stole from your bank teller, but it’s just not as good. You want a pen that makes you want to write with it every day. I have a huge variety of pens that I love (and you can see them all at my My Supplies page), but my very favorite for daily writing is the Pilot Metropolitan fountain pen. Do you need to get a fountain pen to improve your handwriting? Of course not! But you might find that you enjoy your writing experience much more with the smooth ink flow and significant weight of the pen. Writing with a fountain pen might bring out your inner Gregorian monk and make you feel inspired to write with panache. If you want to try out a fountain pen but don’t want to spend so much for one pen, try out the Pilot Varsity disposable fountain pens. They are a great gateway drug… uh, I mean pen… to get you into fountain pens. You also might want to consider using a decent caliber of paper. Of course, notebook paper will do just fine. But there are a variety of options out there for writing practice that might tickle you. 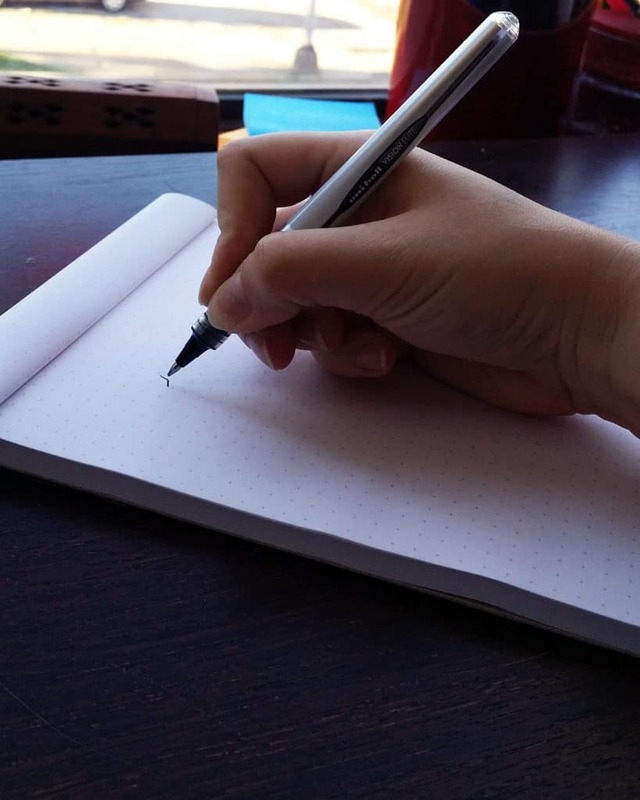 For example, a notebook of French ruled paper might be a great way to help guide you as you practice your writing. I also think that keeping my practice sheets together is better than having them all floating around in my apartment. I typically write in my Leuchtturm1917 journals, using both a dot grid and plain paper. Both are thoroughly enjoyable! When you hold your pen, you should have a relaxed grip. Many people hold their pens too tightly, resulting in cramped penmanship and a cramped arm. You should be able to slide the pen out of your writing hand with relative ease. The pen isn’t going to wildly buck and jump around, so you don’t need to control it. You are working with the pen, you are not controlling a wild animal. So loosen up! A tight grip will result in strain on your muscles and cramped handwriting. A loose grip will be much more comfortable way to write and will result in a smoother flow of writing. You might think this sounds silly. You write with your hand, right? Not exactly! Most folks learned to write with their fingers, myself included. This means that you are keeping your arm and palm stationary while your fingers move the pen around to create the letters. This is not the best way to write. Most master calligraphers write with their wrist and arm while keeping their fingers stationery. If you aren’t sure, sit down and write out a few random sentences right now. Pay attention to what muscles you’re using. Are you using your fingers? Try writing another few sentences without moving your fingers at all. It can be awkward at first, but after a little bit of practice, you will find much more smooth, consistent handwriting. Just like with any physical activity, it’s good to get in a good stretch before you begin. 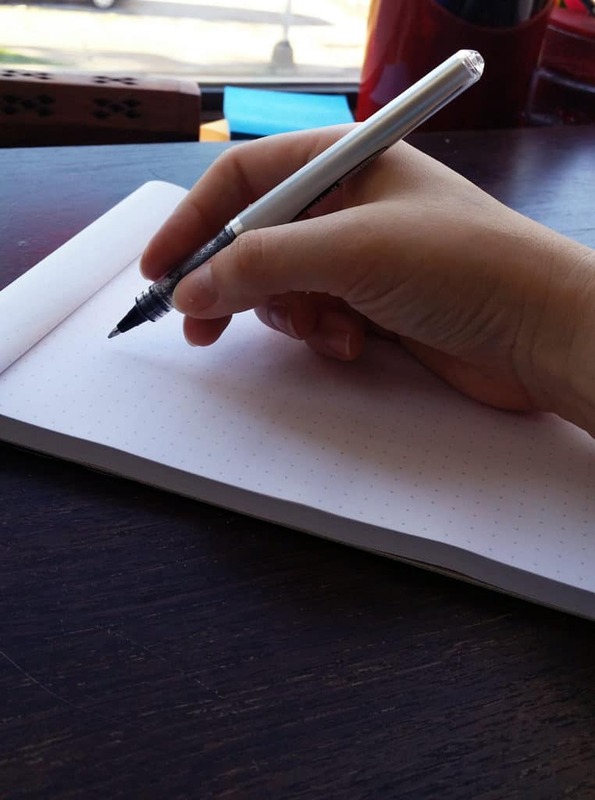 Try flexing your fingers, turning your wrists in circles, and rotating your arms to prepare yourself for a good writing session. You may also want to turn your neck in circles to loosen up. If you begin to write with your arm instead of just your fingers, you will find that you work out muscles you didn’t realize you had. It can be a bit tiring at first, but with practice comes better control and strength. Stretching will help tremendously with this transition. When you watch people with good penmanship write, they typically go pretty fast. This may lead you to the conclusion that you, too, must write fast. But writing is not a race! While you are retraining your body to write with proper form and posture, you need to go slow to build the new muscle memory. It will get faster with time, I promise. 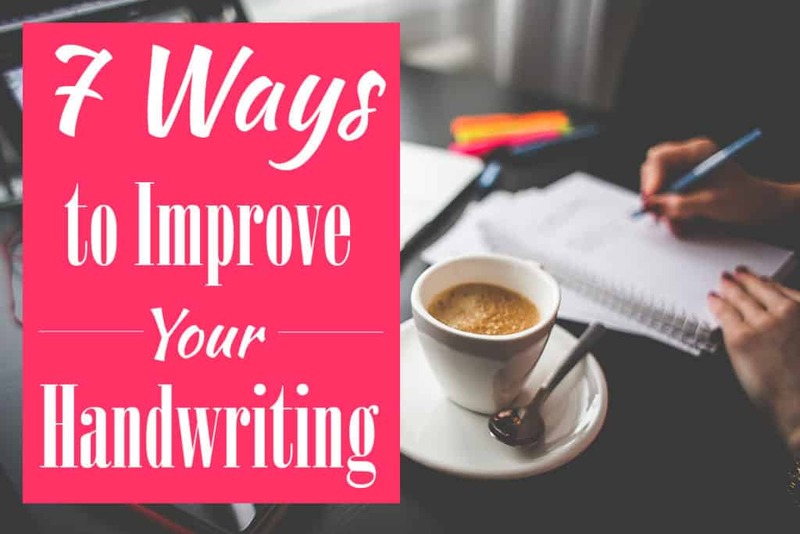 For now, just be deliberate and write slowly to really build the habits and techniques that will improve your handwriting. What I really mean is practice, practice, practice! But for me, anyway, the best practice was three pages of longhand cursive in my Morning Pages. The act of writing Morning Pages has been wildly beneficial to me in a million other ways, but I have definitely tightened up my penmanship after months and months of practice. Whatever you do to practice, make sure you stick with it. Like exercising, the desired change doesn’t happen overnight. So don’t sweat it when your penmanship doesn’t look as pretty as you’d hoped in only a week. If you can commit, you can have the coolest handwriting ever before you know it! So that’s it! Employ one or all of these techniques and I’m sure you can improve your handwriting in no time. Just remember to be patient with yourself and have fun with it. Try keeping an analog planner with the bullet journal to write on a daily basis, or keep a gratitude log. If you want to reconnect with friends and family in a more personal way, try writing letters to hit two birds with one stone. If you want to get a little fancier (and who doesn’t, really? ), pop on over to my ultimate hand lettering guide to see how you can get started with the basics of modern calligraphy! It’s interesting, my third grade teacher back in 1968 said all the same things as you are saying. I should not have written her instruction off as irrelevant. Can you tell me the font that you used in this writing ? I’m sorry Peter, I’m not sure which writing you’re referring to here. Thanks for reading Emily, and good luck with your history class! The points that you made are very well justified. Nicely written! Thanks so much for reading Abhishek! I hope you are able to use them. After reading this post, I’ve just realized that I’ve been holding pens incorrectly all along. Now I’m questioning my entire life…LOL! So glad I found your blog. Glad I could help Martha! Thanks for being here ?